I only discovered the Oblique Strategies card deck very recently in my meanderings online. The deck was devised a few years before I was born, in 1975, by Brian Eno and Peter Schmidt. Each card offers an aphorism that might inspire solutions around writer’s block or a creative problem. Image credit: Oblique Strategies by Stephanie Asher, is licensed under CC BY-NC-SA 2.0. Gregory Taylor goes into great detail about the various editions and availability. A deck can be purchased from the Eno Shop. Numerous apps and web versions exist, simulating the act of selecting a random card. As the Oblique Strategies are copyright, I’m reluctant to link to any of these, as I’m not sure which are endorsed, if any, or if this is even an issue. However, if you are curious to test out the cards yourself, typing ‘oblique strategies’ into your search engine or app search will leave you spoilt for choice. The back-story: Following a 2-year hiatus, I resumed composing in January 2014. This was not on a whim; at the time I was breastfeeding a 9-month old who was waking 3-7 times overnight, and some months earlier, I had also recommenced part-time work as a music copyist. Was I overdoing it? All I can say is that parenthood requires most of your self. Composing is a little thing I can do through the week that is ALL MINE. I don’t write a lot at the moment, but am so proud and grateful to be writing SOMETHING. I spent most of 2013 thick in the blissful-exhausting fog of new-motherhood, and prior to our daughter’s birth, struggled to write a single note of music during pregnancy. Now, caring for an energetic toddler who sleeps infinitely better than she used to, we have managed to establish a steady rhythm to our week, and I’m constantly rethinking and refining my use of time. My ears are tuned to productivity, time-management, life-hacks, better ways to combine working and parenting, and how all these things intertwine with creativity and craft. Time has never been so precious. Nowadays I don’t have the luxury of ruminating endlessly over that single bar. Ok, let’s try extravagant. Working title for the piece: a bit risky, I’ve been hesitant to use it… BOOM, lock it in! That problem section that I’ve been leaving blank: I’ll throw the kitchen sink at it for now, then peel the layers back a little to refine it. This was simultaneously amusing and frustrating: Kieren’s closest friend wants to see him move away from his current realist style to the more distorted look of some of his previous paintings. It doesn’t solve the issues with the current painting, which is too far progressed to suddenly change styles, but by inspiring ideas for future paintings, it gives Kieren some motivation to complete this one. I’m starting to notice the Oblique Strategies all over the place now. By chance this week I stumbled upon Brett Dean’s Eleven Oblique Strategies (2014) for solo cello, also listed at the Australian Music Centre. Dean has composed 11 miniatures, each based on a card from the deck. I like the idea of using the deck as a starting point and subject of a creation, rather than as a tool along the way. 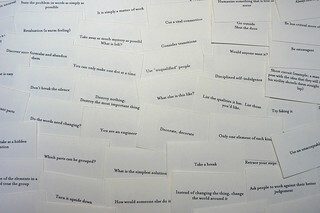 Do you or have you used the Oblique Strategies? Experiences? Let me know your thoughts below.